Sometimes you think you are onto something great but are thrown back by something unexpected. 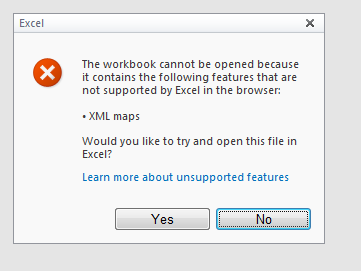 In this case I wanted to work with some XML files and import them into PowerPivot. For this I used the the Excel XML support to import a XML file and create a table from it. Loaded this data into PowerPivot and all looked well. Ok now what ? Only one thing to do .. remove all the references to XML. So I deleted the table and the connection and uploaded the workbook again. After I followec the steps suggested by the help file I could finally upload my workbook to SharePoint. You would think Microsoft, a company that embraced XML in its core applications many years ago, would have made XML a “real” data source for PowerPivot. Hi @David Hager , unfortunately there is only so much you can do with the resources available.